Recently, John Downer Productions, after much research, chose to use San Francisco Bay Boat Rentals and Marine Services and Captain Tony Anastole to film the San Francisco version of their newest documentary for the Discovery Channel, Earth Flight! The film director, Mathew Gordon, and the entire film crew were highly complimentary of the professional, on time services provided by the SF Bay Boat Rentals film division and Captain Tony Anastole. The endangered Brown Pelican was the subject of the film and virtually ALL of the boat filming portion was completed in a record money saving 5 days! If YOU or YOUR company need professional film services from a boat, or for that matter ANY unusual or hard to get professional services in or around the ENTIRE SAN FRANCISCO BAY please contact Captain Tony directly at 415-336-4765! 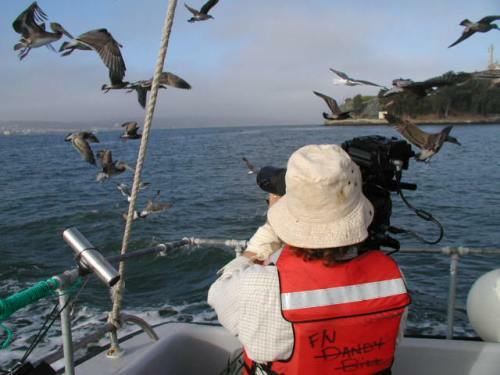 The SF Bay Film Division knows the San Francisco Bay and will get the shot for you! 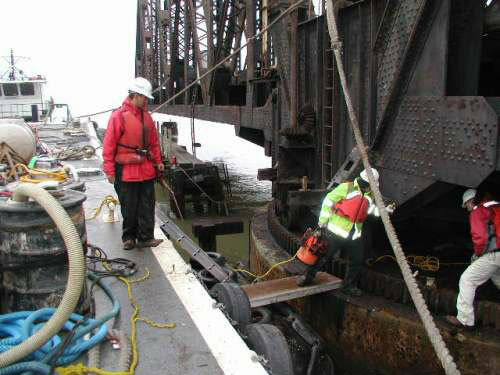 No job is too small or too large for San Francisco Bay Boat Rentals and Marine Services! The Kansas City departs daily from Pier 39 at 12 Noon, 2pm, 4pm, 6pm, and the 7:30 Sunset Ride! The Kansas City is at the "I" Dock, right near The Sea Lions. Rides are only $29.00 and include 1 free beer or soft drink. 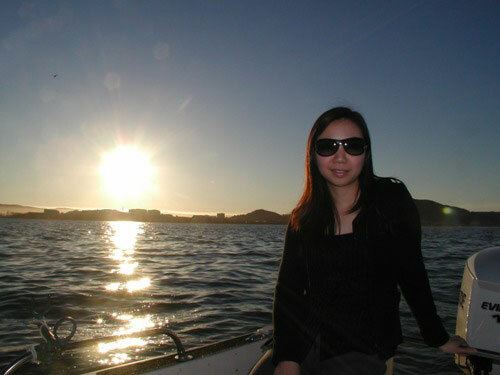 The romantic Sunset Ride is $39.00 and includes 2 free beers or soft drinks (maximum 6 passengers on any ride). This is the most talked about ride on the SF Bay! 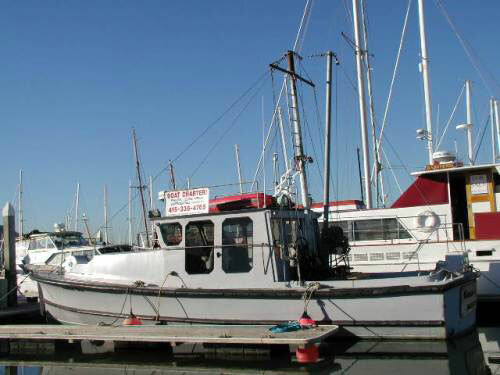 The Kansas City is a wonderful 40 foot tow and fishing boat with lots of character! Tours are 7 days a week when boat is not fishing. Lets Go!!! Advertise on Our Boat - Pier 39, AT&T Park, SF Bay! Over 38,000 locals and tourists have been recorded entering Pier 39 on a single day to see all the great shops, restaurants, but most importantly to view the world famous Sea Lions that have taken over the North end of the dock, making it off limits to all but the Sea Lions! The Vessel KANSAS CITY is next to the walkway, 100 yards from the famous SEA LIONS! Virtually EVERYONE walks by the Kansas City when she is in her Pier 39 port! This is your chance to advertise your Website, Corporate Logo, Message, Photo, Marriage Proposal, New Product, Charity or whatever YOU desire! When people walk by the Kansas City they are less than 20 feet from the Vessel, and always look at the Boat! 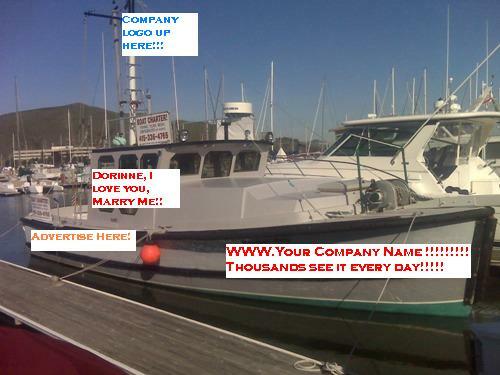 The possibility exists for a corporate sponsor to paint the vessel in corporate logo, and colors, entirely or partially! The possibility to legally have the name of the Vessel "Kansas City" changed to your corporate name exists! For example YOU could pay to have the name changed to "WWW.YOUR COMPANY NAME.COM", "Budweiser Tow Boat", "RED BULL", "Starbucks", "Larry Ellison.com". The possibilities are limitless! The Vessel Kansas City is also available to patrol AT&T Park events with her loud horns blowing drawing attention to YOUR CORPORATE NAME, COLORS, WEBSITE, or whatever you are advertising!!! The roof of the cabin on Vessel "Kansas City" is also available for your advertising allowing the Blimps that fly over AT&T Park to televise YOUR MESSAGE, WEBSITE, etc! While airplane advertising gets much attention, boat banner advertising costs considerable less and can contain many more pictures and logos! The Vessel Kansas City is seen and remembered by so many people! When the Kansas City is not at Pier 39 it is highly visible travelling around the SF Bay as can be seen on this website. If you need effective advertising for the money, dont miss the boat! Call us today. For a resonable amount, you or your company could be soon be recognized GLOBALLY! Get a real Bang for your buck with this great outside the box advertising opportunity, and be postioned for the media to perhaps pick up YOU or your company and take the advertisement GLOBALLY!!! This could be the break that you are looking for! There is only 1 Vessel Kansas City and we have room for you! Vessel Kansas City is at Pier 39 Dock I slip 2. Walk by, have a look, take a ride and see for yourself! Please give us a call at 415-336-4765. San Francisco Bay Boat Rental and Marine Services LLC and Captain Tony (100 Ton Master) are fully licensed and Coast Guard approved to tow your vessel any place in the San Francisco Bay. 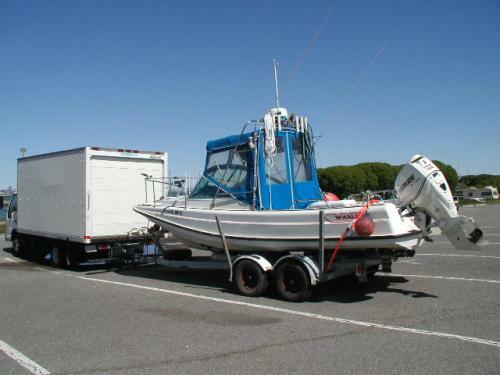 Available towing vessels are the Kansas City, the 21 foot Boston Whaler, and the 21 foot Popeye. We offer Commercial Boat Towing at competetive rates! The 21 foot Boston Whaler is capable of speeds of 40 knots for a fast response time (although we won't tow you at that speed)! Both the Kansas City and the 21 foot Boston Whaler are equipped with Sonar, Radar, and GPS! The above photo shows the Popeye towing a 10 Ton Sailing vessel from Oyster Point Marina in South San Francisco to the Napa River Marina along the Napa River. 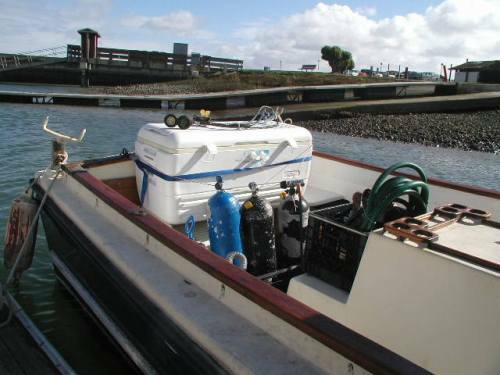 San Francisco Bay Boat Rental and Marine Services LLC is proud to offer diving services and a boat to deliver the diver to your location! We know that when you need a diver it isn't always at a convenient location. We can bring the diver to you even if there is no land nearby (rope in the propeller, etc). We recently assisted a boat near Pac Bell Park who was taking on water, and our diver was able to put a dowel in the hole and stop the leak! We also install and inspect Zinc and propellers, and can be your "eyes underwater" before purchasing a boat or after running aground. We know that many people like to have a diver inspect and replace their zinc in a timely fashion, and we have a fast response time to get a diver to your boat. We offer underwater inspection service in and around the San Francisco Bay. Many people want underwater inspections in a timely fashion. We have a fast emergency response time for all underwater inspections. Most of our underwater inspections are dispatched by boat for an even faster response time! We do light recovery for items dropped in the water. We recently recovered an expensive watch that a mariner dropped in the water at Oyster Point! 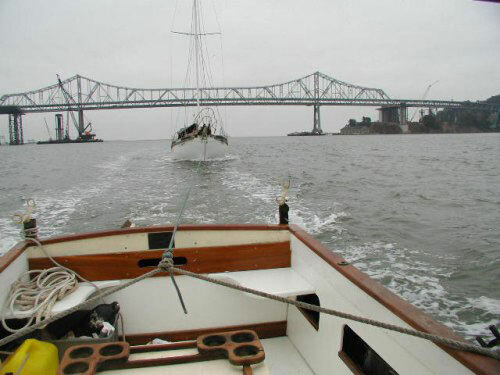 We have over 10 years experience diving on boats in the SF Bay. Keep our number handy on your boat for quick reference (there isn't always internet access on the water)! We recently dispatched our fastest boat with diver aboard to travel from Oyster Point in South San Francisco to Tiburon, Ca to assist a mariner whose Sea Ray (18 foot boat) was almost completely sunk! Our transit time was one and a half hours! 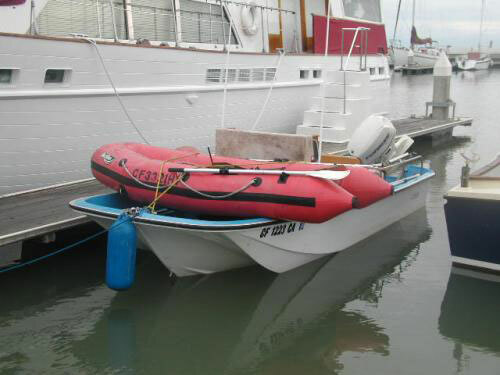 The boat dispatched was the mighty 21 foot Boston Whaler (unsinkable) with E-Tech motor, GPS, and Radar! Please keep our phone number on your vessel, 415-336-4765, in case you or someone you know needs emergency diver service for boats or recovery! 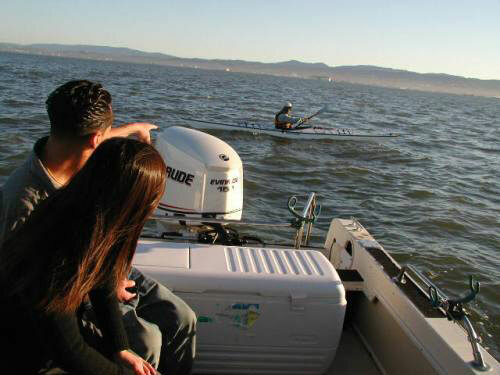 The 21 foot Boston Whaler is especially fun for sightseeing the many interesting places in the San Francisco Bay! Some of these places include Pier 39 and its Sea Lions, the Golden Gate Bridge, Sausalito, Fishermans Wharf, Jack London Square in Oakland, the Nantucket Bar and Grill (Crockett), and so many more. McCovey Cove at AT&T Park is always a popular destination for baseball fans and McCovey Cove fans alike! Our fleet is available for unique SF Bay and Delta tours, picnics, and team building events, at reasonable rates for half or full day tours. We can arrange to pick up your party at most San Francisco Bay locations. The 21 foot Boston Whaler and the 40 foot Kansas City have cabins for when the SF Bay weather changes, as it often does. 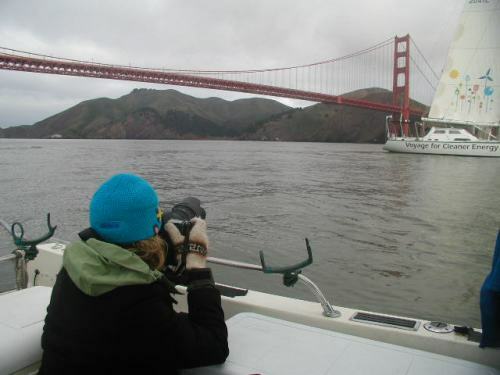 Spend a great day just cruising the San Francisco Bay waters with a knowledgeable Captain! Discounts are available for weekday charters (non-peak fishing season only). Engineers prepare for the 8 mile ride to the Dumbarton Bridge railway crossing on the 21 foot Boston Whaler. Core drilling team and engineers were delivered each day on a timely bases making the core sampling job a success for CTL Group and its clients. San Francisco Bay Boat Rentals and Marine Services LLC made this 16 mile round trip as many as 3 times a day, in many diverse conditions, and often the Radar and GPS were used when conditions would not let us visually see the bridge! The 17 foot Boston Whaler is a popular way to get to remote locations, such as the Newark Slough in South San Francisco Bay. 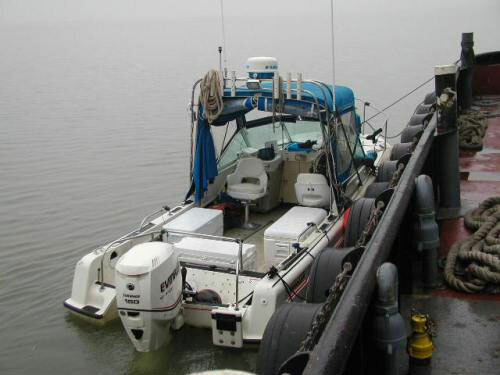 The 21 foot Boston Whaler was hired by the CTL Group, a company from Chicago, to transport their core sampling crew and engineers out to the Dumbarton bridge. The CTL Group preferred the Boston Whaler because of its speed, relability, and unsinkable reputation. The CTL Group also utilized our 8 foot inflatable raft, and the whole package was driven to the Newark Slough from our location at Oyster Point in South San Francisco. We were in the Newark Slough for a total of 3 days! 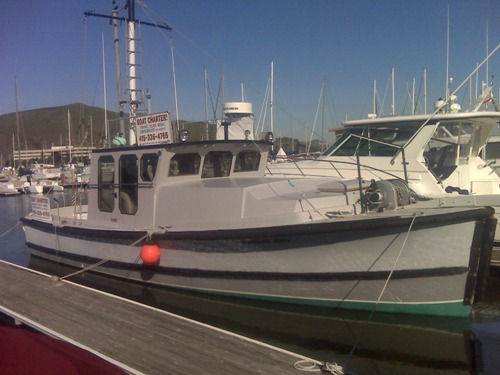 The tug boat company Marine Express also relied on San Francisco Bay Boat Rentals and Marine Services LLC and our 17 foot Boston Whaler to change the crew on its tug boat every 12 hours! 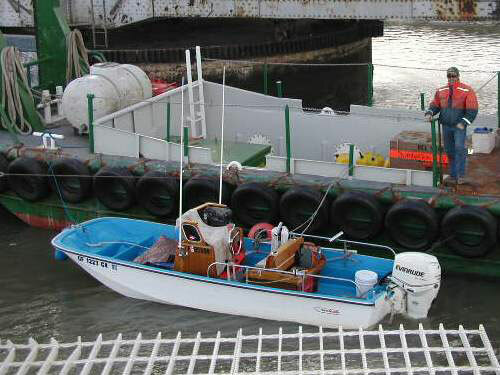 The Kansas City is a sturdy work boat capable of transporting work crews and tons of equipment. A roomy cabin for all weather conditions and a strong deck make the Kansas City ideal for marine film services. It's deck lights turn night into day. Get the right movie or film shot in less time from the Kansas City's roomy deck or 8 ton boom. Use her 110 volt generators to power your marine cameras. We can provide the chase boats! Plug your laptop computer into one of her many 12 volt system outlets to review your commercial or marine film. 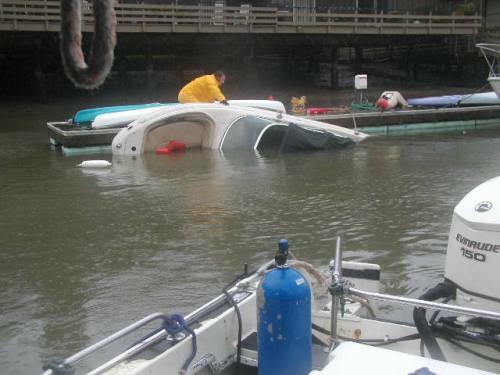 If your boat is taking on water and you need emergency bilge pumps delivered in the San Francisco Bay, give us a call! 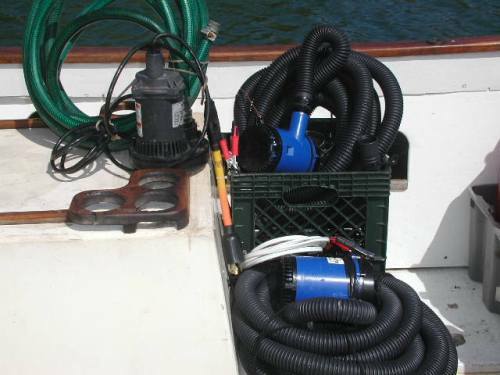 San Francisco Bay Boat Rental and Marine Services LLC offers on the water delivery of emergency bilge pumps, either 12 volt or 110 volt! If you are worried about oil in the bilge, you can also rent or purchase 55 gal containment drums to pump your bilge water into to help avoid costly Coast Guard and State fines for pollution. These emergency bilge pumps can be delivered by truck or boat to most remote locations in and around the San Francisco Bay! 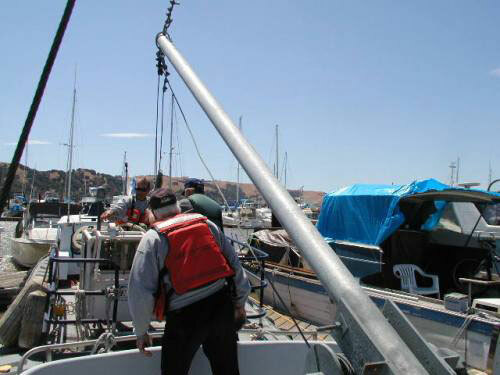 Disclaimer: By renting Emergency Bilge Pumps from SF Bay Boat Rentals and Marine Services LLC, YOU assume responsibility for any spill of oily bilge water or pollution caused while using equipment rented from San Francisco Bay Boat Rentals and Marine Services LLC. Run out of Gas or Fuel? Don't feel bad, many more people have done the same thing! 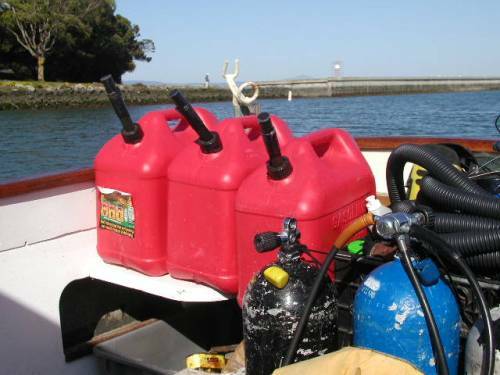 San Francisco Bay Boat Rentals and Marine Services LLC can deliver Gasoline or Diesel fuel to most remote locations in and around the San Francisco Bay! 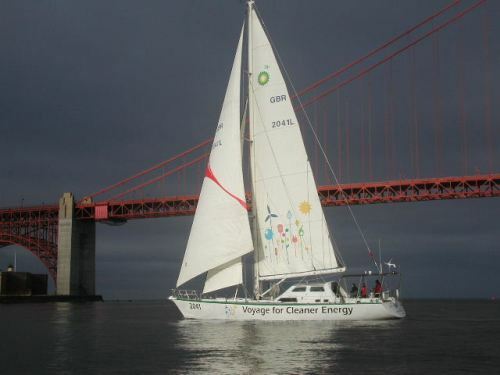 Recently, the 2041 Sailing Team was about to embark on a journey around the world to promote global warming awareness. The 2041 Team needed a boat rental that could be relied upon to pick the professional marine photographers up before dark in order to get photos of their sailboat with a sunrise backdrop of the Golden Gate Bridge! The 2041 Team called for a licensed Captain and the unsinkable 21 foot Boston Whaler with its environmentally friendly E-Tech motor! 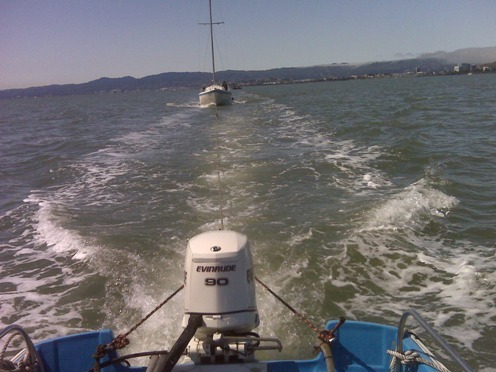 Equipped with radar and GPS, the departure before sunrise was no problem, and in fact the SF Bay Boat Rental team was there early so that no time was lost! The results of this team effort can be seen at www.2041.com. When YOU are paying a team of photo experts and need reliable boat rentals, dependable pick-ups, or local advice, you can depend on the water taxi and bay photo team at SF Bay Boat Rentals! We take your SF Bay Photography seriously! San Francisco Bay Boat Rentals and Marine Services LLC can follow any job up and down the Coast, to remote locations, Lakes, Bays, and Rivers, from Alaska to Southern California, and most points in between! Call today for pricing with 2 1/2 Ton Diesel Bobtail Truck! Excellent choice for Dam Repair, Lake Surveys, Salmon Research, Fish Counting, and remote Movie shots from a boat! At San Francisco Bay Boat Rental and Marine Services LLC we take pride in our 100% on time record and commitment to service! WE WILL GET THE BOAT TO YOUR DESIRED LOCATION! Our 21 foot Boston Whaler is capable of speeds exceeding 40 knots and can keep up with some of the fastest boats on the SF Bay. With a stealth E-Tech motor, radar, GPS, and Captains and operators that are aware of complex maritime laws, it is the perfect boat for discreet photography, repossesion assist, security patrol, and general protection services (America's Cup). We have successfully assisted lawyers and their investigators with photos from hard to access points of land to enhance their cases in a court of law. Our services include waterfront home patrol, boat and yacht patrol, investigations with or without photography, vessel theft recovery, water investigations on the SF bay, lakes, rivers, and so much more - Day or Night! Our boats have 2 way radios capable of direct contact with the U.S. Coast Guard. For all investigations there is an additional cost for a licensed Private Investigator to be on board vessel. For security patrols there is the additional cost of a licensed security guard to be on board vessel. We use professional and licensed photographers. 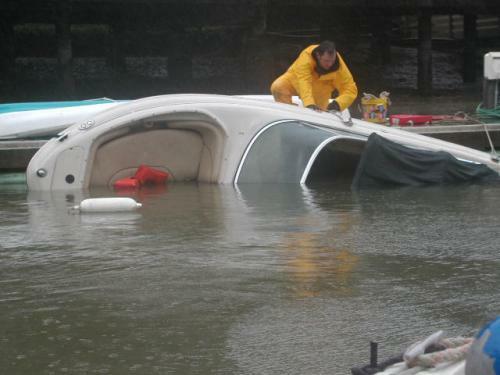 If you feel that you may need our services call Captain Tony directly at 415-336-4765. The Vessel Kansas City, our 40 foot utility/tow boat and former Naval Crew Boat, is ideal for scattering ashes at sea. Up to six friends or family members may accompany the Vessel Kansas City on her journey to scatter ashes at sea. You can request a permit for scattering ashes at sea in San Mateo County or the San Francisco Bay at the time of cremation. The Kansas City is ideal for Military and non-Military ceremonies, is non-denominational and is an affordable low cost, no frills, effective way to scatter ashes in the San Francisco Bay. The trip usually takes approximately 2 hours. Call Captain Tony (100 Ton Master) directly at 415-336-4765. 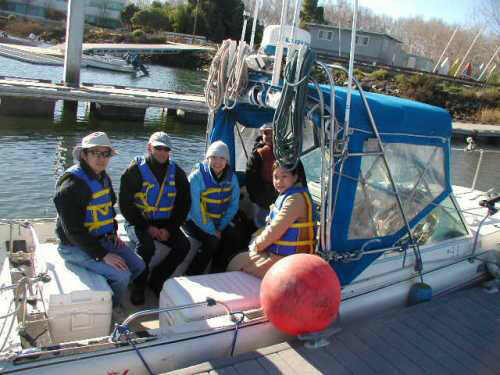 In the event that you or your company need to rent lifejackets/life vests on or in the vicinity of the San Francisco Bay, nearby lakes, jobsites, or movie and commercial film production, SF Bay Boat Rentals now offers lifejackets for rent, from 1 lifejacket rental to 50 lifejackets. 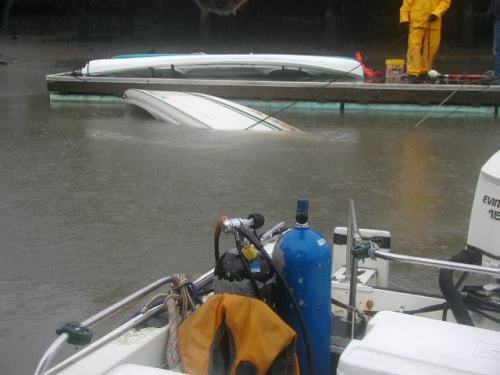 Many insurance companies require lifejackets/life vests when filming or operating around water. Now you can rent instead of making a costly purchase for minimal time use! Ask about our discount lifejacket rental rate for 3 dozen lifejackets or more! Personal flotation devices add a level of safety to ALL activities in or around the water. We rent a variety of personal flotation devices in a variety of sizes!